Originally I got this lens for photographing rowing events and found it to be extremely versatile. I also use this lens to capture birds in flight and have been very happy with the results. Many handheld shots are possible with the VR. Anyway, a zoom is a zoom, and more convenient (if not so heavy) to work with! 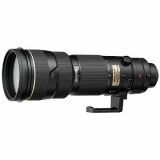 Excellent build quality and image quality Sharpness throughout its zoom range is wonderfull. superbe optique avec une exellente qualité et une très grande souplesse d'utilisation. Have to agree,this is one seriously versatile lens. Excellent build quality and image quality. Wish I owned it when I had my Nikon f5, to use it with some slow slide film would have been interesting to see the quality then, I still occasionally wonder if digital can yet match the best film for quality. A 200-400VR user for the past 2 years, I've been very pleased with this lens. Excellent sharpness throughout its zoom range, even wide open at f/4. Great color/contrast. I almost always use mine handheld, although at 7 pounds, it's a chore. Not much of a downside to the 200-400VR except cost. The best images in my pbase galleries are dominated by 200-400VR shots.